Net Weight: Approx 28 lbs. Weight capacity of each shelf: Approx 66 lbs. 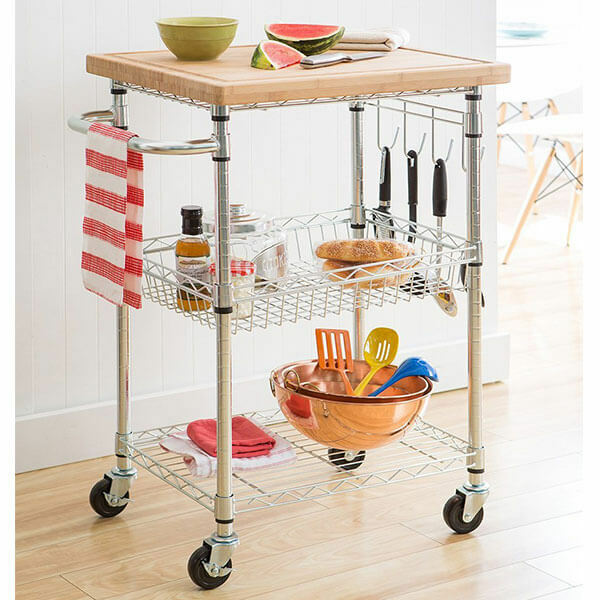 The Giantex Bamboo Rolling Kitchen Cart is a kitchen cart made out of stainless steel, triamine and bamboo. It weighs a comfortable 28 pounds and measures approximately 29 inches in length by 14 inches in width by 33 inches in height. Each shelf can hold around 66 pounds at a time. Includes wine rack, 2 wire baskets, 2 storage drawers and 2 shelves. 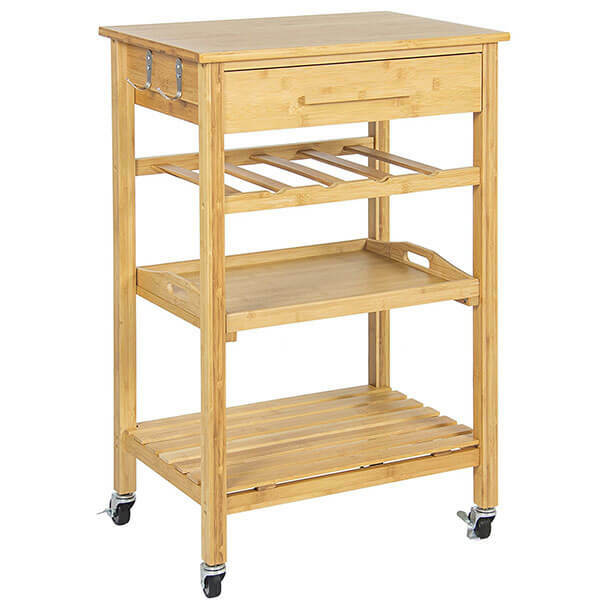 The Haotian Bamboo Kitchen Storage Cart is a bamboo kitchen cart that is made from 100 percent bamboo, which has been varnished for a pleasing finish. This unit measures 72 centimeters in length by 37 centimeters in width by 75.5 centimeters in height. It features a wine rack, two wire baskets, two drawers and two shelves. 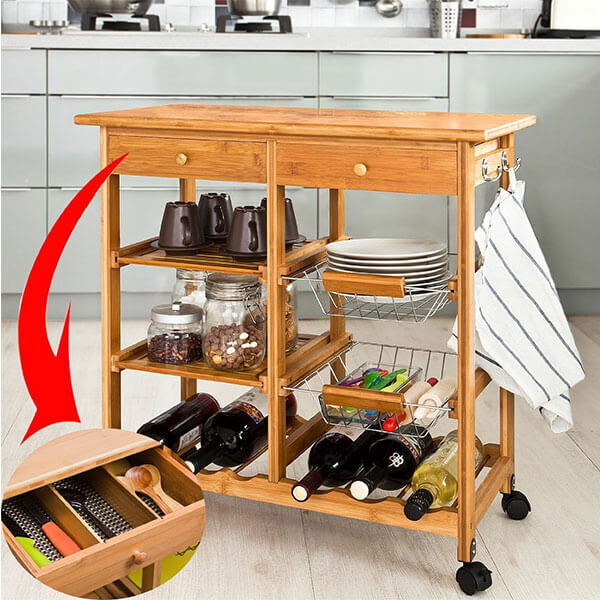 Store your kitchen essentials with the Clevr Rolling Bamboo Kitchen Cart. This rack is made out of top quality kiln-dried and varnished bamboo. Weighing in at around 22 pounds, this unit measures 22 inches in length by 16 inches in width by 35.5 inches in height. 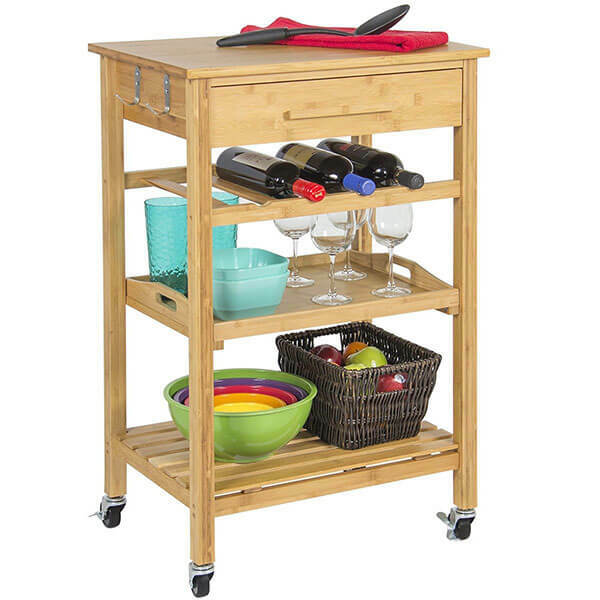 The TRINITY EcoStorage Bamboo Kitchen Cart is a slender, yet durable kitchen accessory for all of your essentials. It features a fully removable cutting board that is made from bamboo and measures 20 inches in width by 24 inches in depth. It also features two shelves and one basket. 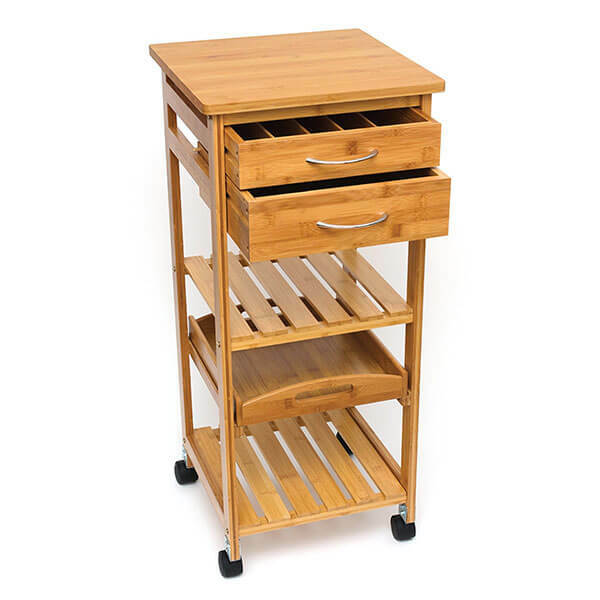 Store items you want close at hand with the Lipper International Bamboo Space Saving Cart. This cart is fashioned entirely out of bamboo wood and comes with two enclosed drawers at the top. There is a pull-out serving tray toward the bottom. Caster wheels allow for easy movement. 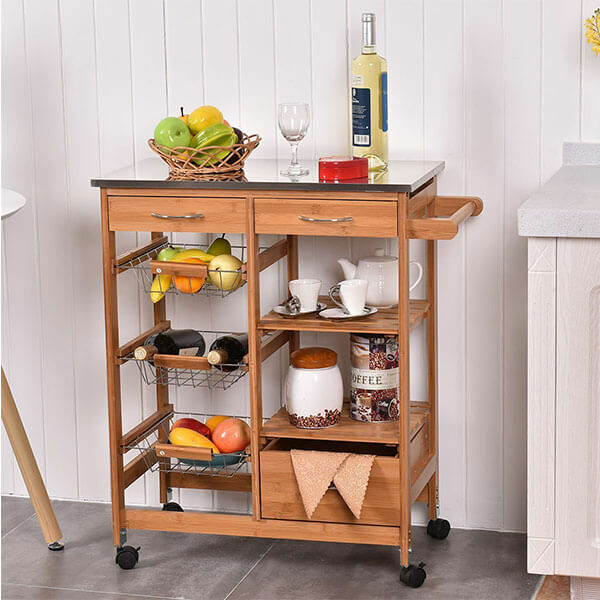 With the Best Choice Products Rolling Bamboo Kitchen Storage Cart, you can keep all of your important kitchen items close at hand. It is made out of durable bamboo and features three shelves and a single drawer. Its four caster wheels make it easy for you to move the cart around.